Tonight, my girlfriend Jessica invited a group of ladies over to her place to make vision boards. 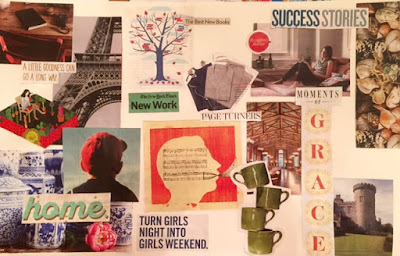 If you're not familiar, a vision board sometimes known as a desire map, is a visual representation of what you would like to manifest in your life. I remember making one in my twenties - so long ago that my images of typewriters, heartthrobs, and REM lyrics were pasted onto the board using rubber cement. This evening we sat around the table and ate and drank things and talked and laughed. We flipped through magazines looking for words and pictures that would best show our hopes and goals. The board I made this evening concentrated on writing for the most part, with family, friends, music, and travel rounding it out. And coffee. Always cups of coffee. The plan is for the same group to gather again a year from now and bring our boards with us to see what's come to fruition. I'll keep you posted. I have done this and I think it really helped to visually focus on goals. Wishing you success!